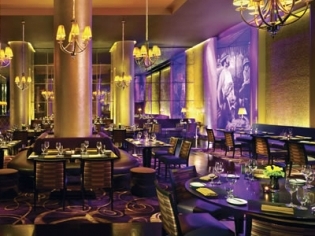 Sage delivers offbeat yet delicious American cuisine in an impressively spacious, elegant dining room that offers both quiet and privacy in the heart of the clamor of Las Vegas. The menu features seasonal organic fare that is unique in its preparation and presentation. Sage delivers offbeat yet delicious American cuisine in an impressively spacious, elegant dining room that offers both quiet and privacy in the heart of the clamor of Las Vegas. The menu features seasonal organic fare that is unique in its preparation and presentation. Signature meats and seafood are paired with herbs and spices in unique and unusual combinations that are sure to delight even the most seasoned foodie! A real draw to the restaurant is their foie gras custard brulee, an appetizer not to be missed. An extensive bar menu features specialty cocktails and beers tailored to pair with your dining selections. Sage offers impeccable service in a welcoming atmosphere of fine dining with a cutting edge global menu that delights with its simplicity and innovation. The Chef’s Signature Menu comes with optional wine or beer pairing. This menu offers a five course selection including an appetizer, salad, pasta, an entree selection and a dessert. An Absinthe Bar Menu is a fun quirky innovation that is offered at Sage. Absinthe is a once banned spirit that is now legal and is served in a unique manner with a flaming sugar cube. If you haven’t experienced Absinthe, this is the place to do it!